It is with deep sadness that we convey to you that our beloved Juan merged with the light on January 2, 2013. He stepped out of the merciless confines and brutal limitations of his earthly body, and now our motorcycle-loving Juanie is riding with the angels in Heaven. No more pain, no more suffering, no more disappointments, no more sorrow for Juan. His family and friends from near and far are left with heavy hearts and tear-filled eyes. Yet, we are rejoicing that his soul is liberated to fly free again and walk, run, jump, do cart wheels through time and space. Thank you sweet Juan for allowing us to be a part of your journey here and for shining your light on so many. You’re gentle spirit, your loving demeanor, your tender eyes, your grace and beauty, your profound statements of wisdom, your courage, strength and bravado – Juan, you will never be forgotten. Each of us who knows Juan has at least one sweet story to share of a profound and provocative memory of a special interaction that warmed our hearts and elevated our spirits. You have left us with invaluable gifts Juan and you have left this world a better place than you found it. Every time we hear the roar of a motorcycle engine, we will think of you, remembering your shy, boyish grin, and a smile will emerge on our face dedicated to you. Friends, the family is in great need of our support to lay their beloved Juan to rest. If you would like to make a donation to help with the funeral expenses, you can do so via the Paypal DONATE button below. UPDATE!!! During the weekend of 4/29-5/1/11, Blissful Bedrooms gave Juan a double dose of dreams come true!!! Not only did we give Juan the Motorcycle/ Transformers themed bedroom of his dreams, but we also gave him the opportunity to be a superstar, as he fulfilled a life long dream and took his very first motorcycle ride with a group of fellow bikers during the Ride with Juan event. In total, more than 50 volunteers took part in Juan’s weekend, many of whom not only volunteered on both days – for the Ride and the bedroom makeover – but also who were working weeks ahead of time creating original art work and custom-made furniture that made the outcome of his bedroom unbelievably awesome, unique and fantastic. Anyone who knew Juan before this experience can attest to the fact that he is noticeably different – a happy and content teenager. From a depressed, forlorn and pitied young man to a hopeful, toe-tapping, song-singing, joyful guy who, by the way, is now envied by just about every male in the world. Even if you don’t know Juan personally, intuitively you can sense from viewing the pictures below that a drastic transformation has indeed taken place in his spirit. Juan is a beautiful and sweet 18-year-old young man who has a diagnosis of Duchenne muscular dystrophy. Muscular dystrophy is a genetic, degenerative disease that eventually affects all voluntary muscles, as well as the heart and breathing muscles. Juan has a gentle, shy smile and soulful eyes that can melt your heart on contact. He currently is enrolled in a New York City Special Education school. As one can imagine, Juan is extremely down about his life circumstances and he is very aware of the progressive deterioration that is going on in his body, and the fatal prognosis that is attached to his disease (survival is rare beyond the early 30’s). Where once, in his younger years, Juan was able to walk and function like others boys his age, he is now completely dependent on a motorized wheelchair for mobility, and on others to perform all activities of daily living for him (i.e., transferring to and from his wheelchair, eating, bathing, grooming, toileting, etc). He has severe muscle wasting throughout his body with little to no voluntary movement of his trunk and upper and lower extremities, and he is unable to sit up independently. Juan possesses some purposeful movement of his hands, right greater than left, which gives him the ability to use a computer and play video games, his primary leisure activities when he is at home. Juan is often melancholy and depressed and he misses a lot of days from school. Sometimes he becomes so despondent that he refuses to even pick up his head and interact with others. This makes his family members very sad, especially his mom, whose eyes well up with tears whenever she talks about it. The one topic that makes Juan extremely happy, and leads to his adorable, characteristic head tilt is MOTORCYCLES. When he experiences these common episodes of dejection, those who know him and love him would give anything to see that heartwarming head posture, accompanied by his curious and wonder filled eyes, which more than anything conveys a sense of hope and optimism. Juan lives at home with his mom and three sisters on the sixth floor in a low-income housing structure in the Bronx. He has his own bedroom, which encompasses a hospital bed and an oxygen tank. His favorite color is blue. He loves science fiction and fantasy figures, including Iron Man and GI Joe, with his all-time favorite being the Transformers. Juan is captivated by the book The Outsiders, which he was introduced to this school year. He enjoys watching movies and his taste in films is varied and diverse, ranging from contemporary Hollywood action films, to sentimental and emotional movies. Juan’s fascination with motorcycles is so intense that he spends much of his spare time either looking at magazines featuring motorcycles, or surfing the internet in search of motorcycle images. Juan dreams of the freedom and thrill of driving a cool, fast, sporty/futuristic motorycle. Juan dreams of living in a fantasy world where superheros overcome obstacles and save the world from destruction. JUAN DREAMS WITHOUT LIMITS. However his physical reality is filled with challenges most of us cannot even begin to imagine. Although we certainly cannot change Juan’s diagnosis, we can change the quality of his life and the peace and contentment he feels in the environment where he spends so much of his daily life – his bedroom. Most importantly, we can infuse his present reality with LOVE- the most powerful healing source in the universe!! While the Ride with Juan was going on, another team of dedicated volunteers - aka TEAM JUAN - were hard at work transforming Juan's bedroom into the Motorcycle/Transformers bedroom of his dreams. In fact, work began on Friday morning (4/29) and went straight through to Sunday evening, when his bedroom was finally revealed to him and his family at about 8:15 P.M. I am sure you will agree that the results are mind blowing, and demonstrate the power of love and endless possibilities that exist when a group of compassionate individuals come together to make the dream of a needy individual as important as their own. It is beautiful when someone goes out of their way to help one of their own family members in need. But when someone wholeheartedly extends themselves to a stranger, or a person they only know superficially, and become family as a result of that experience, that is downright astonishing! Each and every person involved in Juan’s dream weekend was a integral piece that completed the puzzle leading to his happiness, and have contributed to something so profound and far reaching, that words cannot even begin to express it. We changed the world for better during that weekend, believe it! On Saturday April 30th, beginning at 8:00 A.M., more than 30 volunteers - aka TEAM RIDE WITH JUAN - came together to carry out what the Bronx Motorcycle and Car Clubs described as a historical event, the likes of which the Bronx has never seen before. The Ride with Juan was the first of its kind to ever happen at Crotona Park and the first motorcycle ride to include the very person they were doing it in honor of. After days and days of rain, the sun shined and the temperature declared that it was finally t-shirt weather. 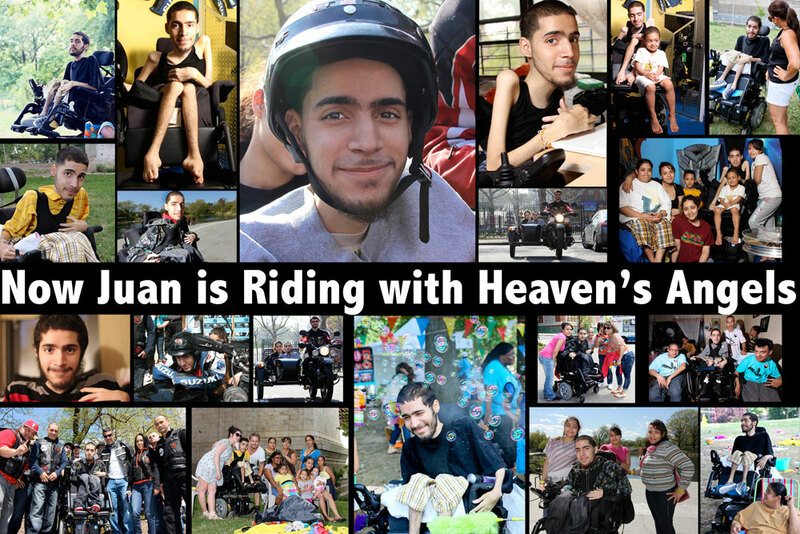 Thank you to all of the generous ORGANIZATIONS/BUSINESSES and INDIVIDUALS who supported Juan’s dream weekend by donating funds, products, food, services, materials, etc, and/or facilitating tasks that were imperative for the success of this weekend of love for Juan. 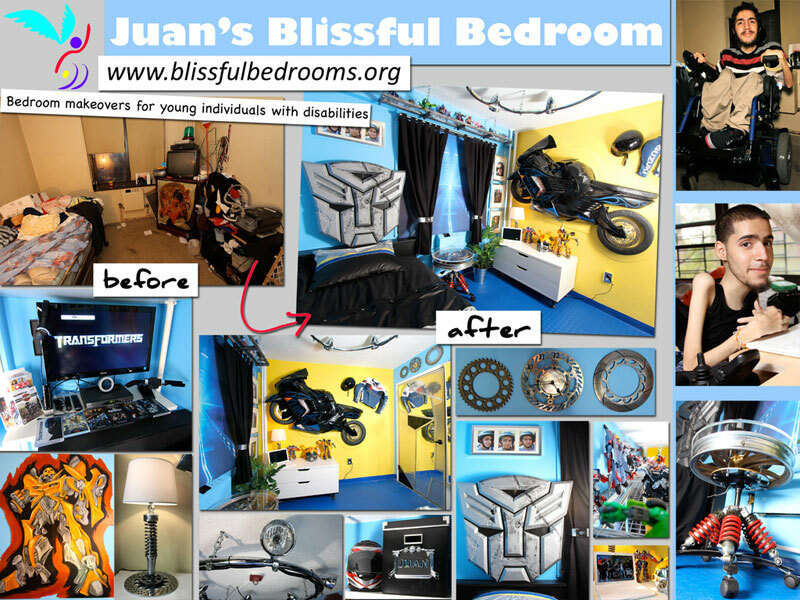 The Ride with Juan and Blissful Bedrooms makeover could not have been possible without the help of all involved!